This was poured into a nonic pint glass. The appearance was a dark brown really close to black color with a one finger white to off white foamy head that dissipated nicely. A decent amount of lace roamed around the glass. The smell had a nice light chocolate, coffee with a variety of spices and a little bit of dried fruit. The taste was mainly the same with a light vanilla and light oakiness. The mouthfeel had about a medium body with a creamy smooth little bit of heaviness. I like how that feels, definitely a stout. Overall, what a nice American Stout done by DFH. I'd have again. Pours dark brown, with a fleeting head that leaves a "ghost" on the surface of the beer. Complex smell. Roast notes intermingle with caramelized sugars and licorice. Kind of herbal. Very herbal flavor. A minty-licorice flavor dominates throughout. A bit chocolatey and ends with a soft roast kick. Huge, thick body, like a Grade A amber maple syrup. Picked up a single bottle of this a few weeks back at Good Beer in New York. I never had this before and it looked different than other Stouts that I had tried before. Like others on here, I was a bit disappointed in this since the difference wasn't enough to make this stand out in a sea of dark offerings this time of the year. This had a dark pour to it with a frothy head that lasted quite a long while. The carbonation was there in taste but it wasn't powerful enough to last through each sip that I took. There was a roasted undertone to this underneath the burnt coffee and root beer flavors that hit me up front. What surprised me the most was how weak this was in terms of mouthfeel. This wasn't strong at all in terms of body or alcoholic content and only the burnt notes lingered in the aftertaste. I know that this wasn't soda but it reminded me of it as I worked my way down my pint glass. No doubt that the alcohol is an afterthought here as I could have downed an entire four-pack in a sitting. Whether I would want to is another story. Yes, this is a Stout but with so many others our there, why bother with this one? I'd rather go for a Black IPA and get the best of more than one world! 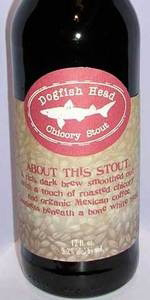 This is only a go for die-hard Dogfish Head fans. A- black looking body with a small khaki colored head that doesnt last very long and leaves a small ring of lace after every sip. T- the taste is very roasted and dark. lots of coffee and a small amount of chocolate. M- a little thinner than i would have liked and very bitter. leaves the mouth feeling very dry. D- easy enough to finish, but with all the other great american stouts out there i dont think id reach for another anytime soon. maybe the bottle was just old, but i think i remember liking this one better last year. I liked the idea behind this beer, but overall I think it lacked something. The coffee tones were a nice touch, as you might expect in your stout. The drawback, however, was in the harshness. Even served at around 60 degrees the alcohol bit into the cheeks and overwhelmed the hints of what could have been. I still like the beer, and wouldn't mind trying it again some day, but there are some stronger competitors out there. Another detail I might mention is the smell. Unique, I'll grant it that, but still abrasive, and like the taste, only hinting at the great idea the spawned the beast. Middle of the pack for Dogfish head, from whom I've come to expect both the best and the worst. A: Dark brown color; almost black. Poured a 3 finger foamy brown head with excellent retention. Splotches of wavy lace; lots of legs. S: Earth, coffee and milk chocolate. A light smokey character. Good without being intense. T: Toasted malts up front; coffee and milk chocolate. The coffee flavor is almost smokey and nutty versus bitter. Chocolate flavor lingers a bit in the finish. M: Medium body (maybe a little light for a stout?). Moderate carbonation (more than expected in a stout?). Mildly dry in the finish. D: Regardless of the feel, it was very drinkable; smooth and pleasing. Moderate ABV. I had 3. Wow, what's that? A beer from Dogfish Head that isn't "weird for the sake of being weird"? Wow, that ironically, makes this one of their more original brews. Looks appealing. Not quite the black you'll see in a lot of other stouts. Smells decent. Taste has a faint hint of smokiness to accompany the lighter chocolate, coffee and uh, chicory? A good session stout. Solid stuff, decent price. Reliable, never had an off bottle. Tastes like your usual stout with an added fruity-ish flavor that I'm personally down with. Solid beer, enjoyable mouthfeel and I feel like I could drink several of these if I was more of a stout guy. Love the way it looks, and it definitely has a lot to offer if your a stout guy. But I do wish it was a little more robust than it is. I think with little more character, it'd be a top-notch stout.